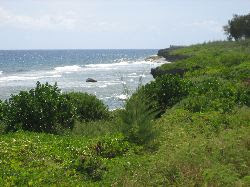 Right alongside a golf course, Agingan Bay is rich in Saipan history. 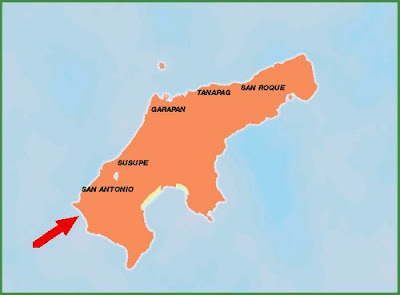 A thousand years ago it was the site of a large ancient Chamorro village with palm-thatched huts built on latte stones. The village survived 500 years until the Spanish military landed on this beach in 1684 and changed the local culture forever. 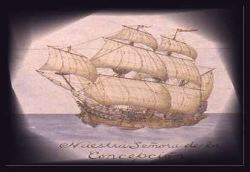 Before the Spanish military arrived, the Spanish galleon Concepcion sank in 1638 at the point on the right side of the bay spewing its priceless treasure into the ocean. Some washed up on shore and pieces of its pottery can still be found today on Agingan Beach as well as Southern Invasion Beach. Prior to WWII Agingan Bay was a Japanese farming village. A Shinto Shrine, stairs, and broken Japanese pottery is about all that remains from that time. This beach, same as all beaches in Saipan, was heavily fortified during WWII. You can enter a large Japanese bunker and a smaller 20 mm gun bunker. Bullets from machine gun nests are on a smaller beach on the right side of the bay. 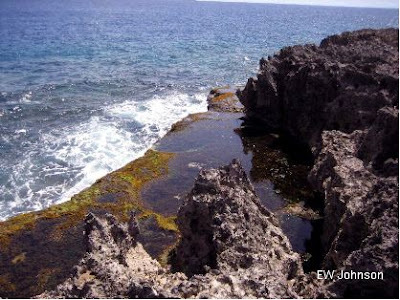 Today Agingan Bay is a beautiful area with beaches of many kinds, sandy, coral, and lava rock. I enjoy exploring this area and it's only one-tenth of a mile from my house. Tinian Island can be seen across the bay. 20mm WWII Japanese gun bunker right on today's golf course. This is another Japanese WWII bunker on the beach. This is one of three in Saipan that were built from German design plans. In 1945 this golf course was a large U.S. military city. Agingan Bay from the plane. sorry, it was agigan where we used to treasure hunt. Not yet. Do you have any ideas.